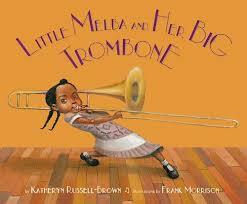 This new picture book by Katheryn Russell-Brown and Frank Morrison tells the true story of Melba Liston, who started playing her big trombone when she was just a little girl. She went on to become a celebrated jazz musician, playing with Billie Holiday, Dizzy Gillespie, Duke Ellington and Quincy Jones. The book is awesome on several fronts — Morrison’s artwork is compelling and amazing, while Russell-Brown tells an interesting story of talent, tenacity and success. But what I want to point out today is how this book uses little details to make a big impact. The first example is in the story’s second sentence. It reads: “Little Melba Doretta Liston was something special.” Putting in Melba’s middle name is the perfect touch. It makes her sound special, and because she’s a baby at this point in the story, it makes perfect sense because that’s how people talk about babies. Yet, I bet most writers wouldn’t have thought to do it. Perfection! Another example is how Russell-Brown uses onomatopoeia, or words that sound like what they mean. In this story, guitars plink, basses hum, drums thrum-thrum, pianos ping-pang and horns tremble. These words make the story fun to read and immerse us in Melba’s musical world. They’re a small touch with a big punch. Then, Russell-Brown works in some words from the 1940s and ’50s, when Melba was young. She writes, “The cool brass of the horn felt swell on her fingers.” This one word serves two purposes. It puts us in the proper historical time period. And, it provides some cool internal rhyme that’s fun to read with the repeating “eh” sound in “felt” and “swell.” Just a tiny touch that makes this book a winner to read. And when you do read this book, which was published by Lee and Low Books in 2014, I know you’ll find even more small touches to admire! Frank Morrison, Katheryn Russell-Brown, Pat Zietlow Miller. Bookmark. Thanks for this writing tip! I love studying picture books. Pat, I love you pointing out these details that I might never have noticed, thank you! What a beautiful book! This looks and sounds like a gem, Pat. Great observations, and I LOVE the front cover image! Thank you for sharing how little details can give such impact to a story. Your description of this books is so delightful that I’ve put in on my list of books to buy!